LASIK is an eye surgery that treats myopia, astigmatism, and presbyopia. LASIK is a well-researched and established procedure it has over 20 years of proven results. As compared to glasses and contact lenses which only provide temporary vision correction, LASIK is able to grant individuals 24/7 correction of vision. *iLASIK is a newer LASIK method that is an improvement of traditional LASIK. iLASIK is the only LASIK method safe and accurate enough to be usesd for NASA Astronauts and US Navy SEALs. As the LASIK industry continues to develop, more and more LASIK treatment methods have entered the industry – TransPRK being one of them. So, what is the difference between TransPRK and LASIK? Which one is better? All LASIK methods follow the same general procedure the cornea is reshaped by a laser to correct vision. 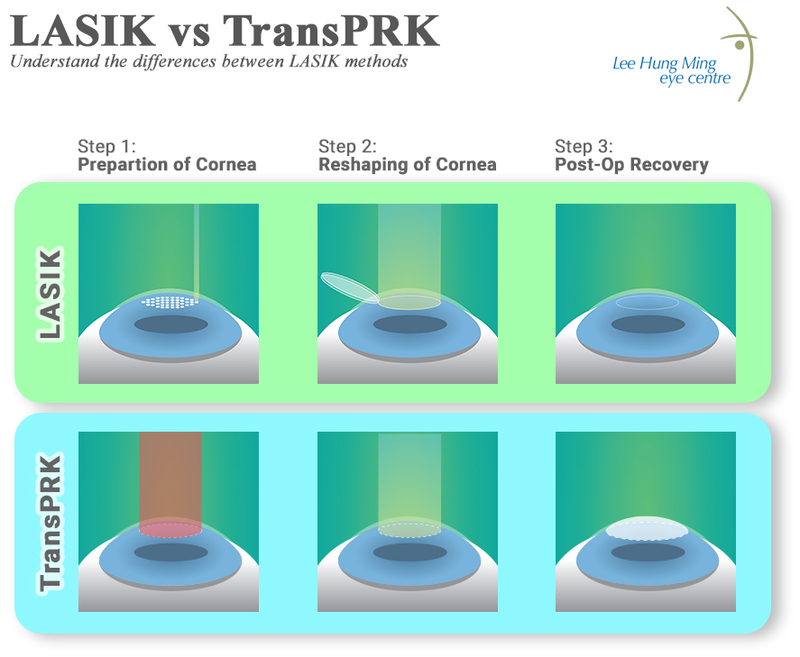 The diagram below highlights the differences in treatment process between TransPRK and LASIK. LASIK/iLASIK An IntraLase Femtosecond laser creates a uniform layer of microscopic bubbles just beneath the surface of the eye. TransPRK – A Schwind Amaris 1050RS laser vaporizes the corneal epithelium cells. NOTE: Both methods are bladeless, all-laser, no-cut, and no-touch. LASIK/iLASIK & TransPRK This step is the same in both methods. An excimer laser is used to reshape the cornea, refractive errors (myopia, astigmatism, presbyopia) are corrected. LASIK/iLASIK After 1-3 days, vision is generally clear enough for patients to return to work or school. TransPRK A bandage contact lens needs to be worn for 5 days for the vaporized epithelium to heal. Patients can return to work or school after 1-2 weeks. Misconception: Flap methods (LASIK, iLASIK) are dangerous and cause flap complications. Flapless LASIK methods (TransPRK, Epi-LASIK) do not have any complications. Patients need to bear in mind that, regardless of the type of treatment, there are inherit risks in every surgical procedure. In general, LASIK treatments have excellent safety profiles and high success rates. The best way to minimize post-surgical complications is to choose an experienced surgeon whom you feel comfortable with. Misconception: TransPRK does not touch the eye, all other LASIK methods do. Therefore, TransPRK is safer. False. All LASIK treatments involve contact with the eye. This may be in the form of surgical instruments or lasers. As of this time of this article, all LASIK treatments make use of an excimer laser to reshape the cornea. Older methods of LASIK used blunt microkeratome blades. Newer methods use high-tech lasers (IntraLase laser in LASIK, Schwind Amaris laser in TransPRK). Misconception: One will always have to worry about flap complications after LASIK and will never be able to play contact sports again. False. In most cases, the flap heals after a month. After recovery, the cornea returns to normal. Patients are able to resume playing contact sports (tennis, basketball, soccer, etc.) after a month. In addition, if you were to be hit directly in the eye during contact sports, you are likely to sustain eye injuries, regardless of the type of LASIK surgery you had done. Misconception: ____ LASIK treatment is the best option for every patient. Explanation: False. There is no one-fits-all treatment in LASIK. Each method has its pros and cons. A LASIK assessment will be able to let you know which is best for you. Find a clinic that has multiple treatment options and a good track record. – 6 awesome things you can do after LASIK? – How much can LASIK save you on contact lenses? – Do glasses adversely affect our love life? 46% of Singaporeans think so. Our standard LASIK Assessment costs $210.79 (inclusive of GST). It includes a series of detailed eye tests and a consultation with Dr Lee, where he will suggest a suitable treatment method for you. The soonest you can have surgery done is one day after the assessment. Please lay off your contact lenses for 5 days (for soft lenses) to 7 days (for hard lenses) before the assessment.